Gabriel Zech is a student of International Relations at the London School of Economics and Political Science. Between 6 and 11 million people were killed during the Holocaust. Around 2.5 million of them were murdered in concentration camps. At least 800 thousand died in ghettos. Up to 250’000 were disabled and living in institutions. No matter how much of a sad and shocking reality these numbers represent, this is all they really are: numbers. When thrown around among many other statistical figures they carry little emotional baggage. They become devoid of intrinsic meaning and have a very limited capacity for storytelling. One of the ways of truly internalising the sheer emotional tragedy to human life brought by the Second World War is visiting the Auschwitz II concentration camp. There, visitors are face to face with numerous rooms full of shoes, clothing, suitcases, and – usually the hardest to bear – the hair of many of the victims killed in the facility. Some get sick by the daunting visual impact. Most are emotionally distressed. But everyone goes home having gone through the same cognitive process: having their perception on the Holocaust changed through a first-hand visual experience of this appalling catastrophe. This is where the capabilities of virtual reality in presenting information come in. Only recently has the mass media and the public become aware of the revolutionising capacity that virtual reality and augmented reality provide through interactions with data. By being able to play around with visual projections of data – whether we are talking about mathematical models, health and social research or roller-coasting through the Nasdaq – people are introduced to a whole new 3D analytical framework to better understand and make sense of large amounts of knowledge input. 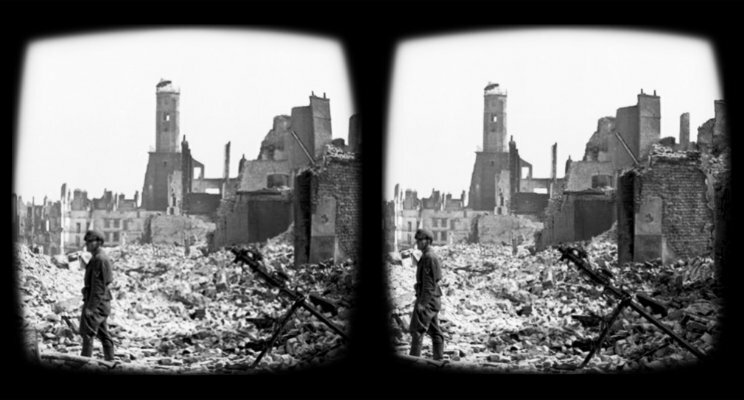 However, it is in storytelling, such as that of being presented a visual contemplation of the tragedy in a concentration camp, where virtual reality’s biggest potential in creating transformative experiences lies. The advantages of being in an immersive virtual environment over simply watching a video can be manifold. One of them is how the user can explore information in a way that traditional visual mediums cannot offer. A relevant pioneer here is the DeathTolls Experience, a VR journey that allows the user to acquire an emotional perspective on the impact of wars. By passively wandering around areas full of bodies whose count correspond to the number of actual deaths incurred in the conflicts (such as the 1995 Srebrenica Massacre in Bosnia and Herzegovina or the ongoing wars in Syria), the user can visualise statistics in a non-abstract way. By seeing how many casualties military conflicts incur in an organic and observable way, people are capable of realising the seriousness and magnitude of humanitarian crises. 10 thousand or 10 million deaths are not simply numerical figures anymore: they become a visually tangible reality. VR’s immersive character also means that it allows people to experience the world through radically different perspectives that can ultimately change how we perceive the lives of others. Notes on Blindness, an award-winning documentary, but also a film and a visual simulation of how it feels to be blind, does exactly that. Inspired by the audio diary that Professor John Hull of the University of Birmingham kept after going blind, the team behind the project uses innovative animations and sound design to show users how a blind person cognitively perceives the environment around them. And if that idea of putting a healthy person in the shoes of someone who has mental or physical issues is extended to the many other common health conditions people face (such as schizophrenia, psychosis, anxiety, panic disorder, among others), this means that VR has the capacity to be a powerful tool not only in educating and informing people, but also in developing empathy for the suffering of others. And there are numerous other storytelling projects using immersive VR for thought-transformative reasons. They range from teaching Irish and Chilean history through the eyes of soldiers and prisoners; understanding the relevance of gender-related inequalities by impersonating a girl growing up in Sierra Leone; visiting a museum of stolen art to grasp the cultural importance of recovering lost artworks; to observing the effects of the collision of science and spirit in an indigenous community in the isolated Western Australian desert. Therefore, virtual reality’s potential lies not only in entertainment and business-related applications of virtual environments: it is also proving to be a potentially revolutionary force in education and journalism. It allows a level of immersion that no other form of media communication allows, having the capacity to deeply transform users at a personal and emotional degree by creating reality-bearing experiences. Storytelling attains a whole new level in which its impact is maximised because the user has a first person point of view of any given situation. People can interact with that virtual environment, they can see and feel just like another individual would. And with the evolving technology, the increasingly affordable devices and the attention that virtual reality has been attracting, the availability and quality of VR storytelling content is growing bigger and bigger, day after day. If you are interested in virtual reality documentaries, the International Documentary Film Festival Amsterdam (IDFA) has long been featuring and promoting storytelling VR projects.